The CDM1000 is a multi-usable desktop microphone base. 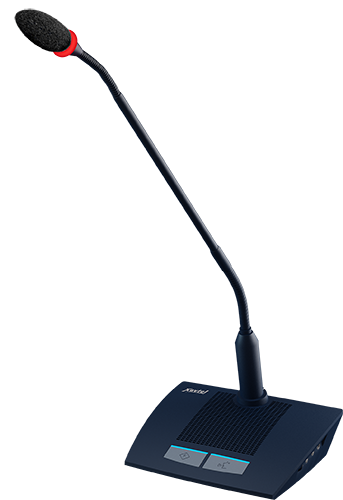 It comes with two buttons and status LEDs for speaking or function selection, and a XLR connection to connect to Xavtel’s gooseneck microphones, the mic is available in different length (26/40/48/60cm), 3rd party microphones can also be supported. The CDM1000 contains a built-in loudspeaker for smaller applications with no external amplification. The volume setting for this loudspeaker can be done with the volume pot at the right side of the unit. At the same side, there are 3 mini jack connectors, one is a microphone input, the second a line output, the third is for future use (VOTEPAD-AT). The Senator Designer software allows the CDM1000 to be programmed and switched from the standard "Delegate mode" into an "Interpreter mode", making it as an easy and cost effective Interpreter station. In this case, either the internal loudspeaker and microphone of CDM1000 can be used for the interpreter (sitting in a different room) or the mini jack connections can be used to connect to a 3rd party headset; therefore, the interpreter can sit in the same room and listen to the floor channel while translating into another language. The two LEDs placed over the talk and the function buttons will indicate the status of the CDM1000.